Wenger would welcome Henry in coaching role at Arsenal! Arsene Wenger has reiterated his claim that the doors are open, should Henry decide to test his mettle in coaching role at the club he won the Premier League with. After seeing off a loan spell by the Arsenal legend Theirry Henry at the Emirates, the Frenchman Arsene Wenger has reiterated his claim that the doors are open, should Henry decide to test his mettle in coaching role at the club he won the Premier League with. "I welcome people who have played for us to come back but not (for just) an honorary job." 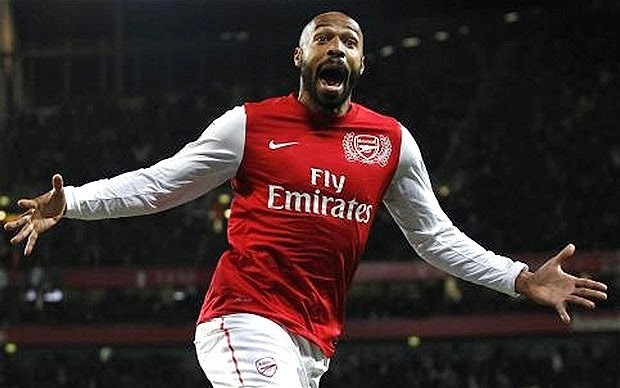 Henry who played for Arsenal 10 years before making debut in Spanish LA Liga has been tipped by many to hang his shooting boots at the end of this season in the American League. And like Arsenal who opened their arms last time the Frenchman set his foot on the English soil, they are ready to do the same this time as claimed by their manager. At 37 years of age and having played 122 times for the American side New York Red bulls, the striker has shown he has what it takes to succeed at the highest level. He has scored 51 times for the US side and that was mainly the reason why Arsenal gave him the chance to play on loan, back in 2012. Signing for Arsenal for a fee of around 11 million pounds in the summer of 1999, Thiery Henry gone on to become one of the greats of the modern game. His notable seasons with Arsenal, which includes the invincible season in which Arsenal failed to lose a single match, has been source of inspiration for the young Gunner coming off the ranks. Wenger said regarding Henry's future at Arsenal as a coach: "It's not impossible." Henry has also sung praise of his former boss by claiming that Arsene Wenger has glamored the Arsenal era and it is due to his duties on and off the pitch that Arsenal has been so successful over the years.